The Denver Broncos have owned the AFC West ever since 10-time All-Pro quarterback Peyton Manning signed with the team during the 2012 offseason. 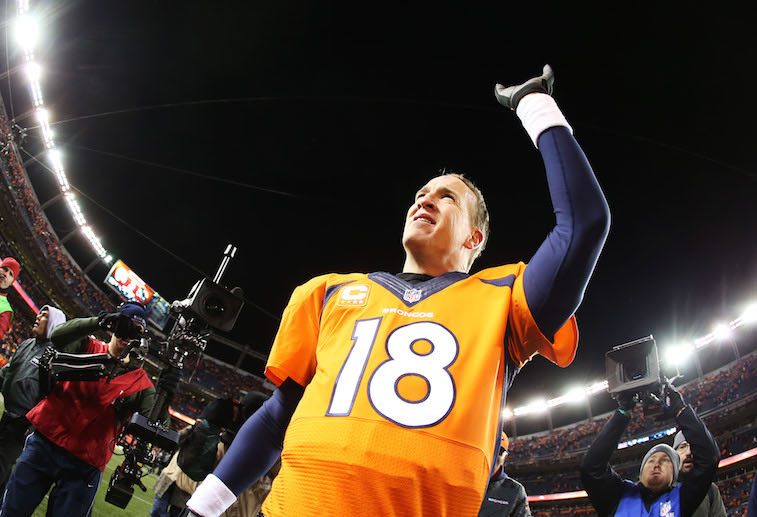 During Manning’s three years with the team, the Broncos have gone 17-1 against their AFC West division counterparts. Ironically, it could be the Denver defense that leads them to a division title this season. Outside linebackers Von Miller and DeMarcus Ware should both put up huge sack numbers in new defensive coordinator Wade Phillips’ 3-4 defense, and their trio of Chris Harris Jr., Aqib Talib, and Bradley Roby are as good as any cornerback group in the league. While the Broncos remain as the heavy favorites to win their fifth-straight division title, their competition in 2015 should be much tougher. The Kansas City Chiefs should again have one of the league’s best defenses, led by All-Pro outside linebacker Justin Houston. Their offense should be much stronger in 2015 with the addition of wide receiver Jeremy Maclin and an improved offensive line. The Oakland Raiders aren’t going to be a playoff team this year, but things appear to be headed in the right direction for the silver and black. Linebacker Khalil Mack is one of the best young defenders in the NFL, and if the Derek Carr-Amari Cooper connection proves to be the real deal, the Raiders could be back in business. 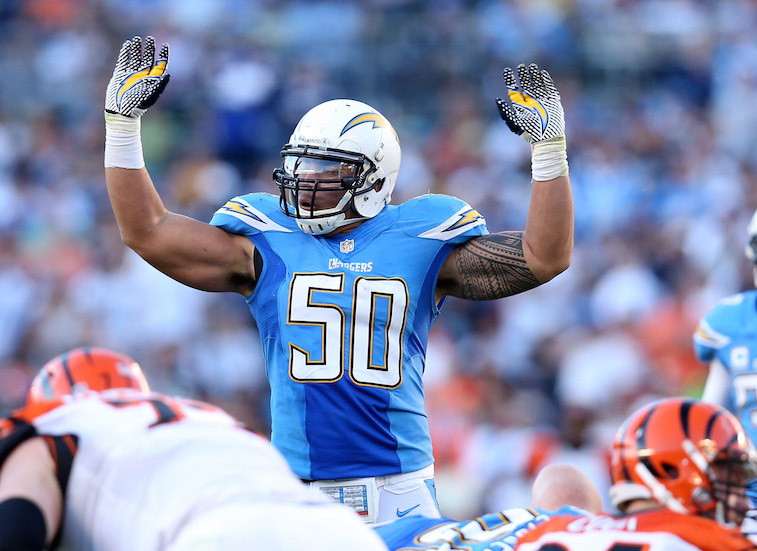 The San Diego Chargers could very well be playing their last season in San Diego. With that being said, we believe they have the talent to sneak into the postseason as a wild card team in 2015. Philip Rivers will be back with the team for at least one more season, and whether you love him or hate him, you cannot deny that the guy knows how to win games. The key to their season, however, will be their performance on the defensive side of the ball. The AFC West has the makings of being one of the most competitive divisions in the NFL for the 2015 season. Here is a preview of the division that includes several major storylines to follow, a list of intriguing position battles to track, and a list of potentially impactful rookies. 1. 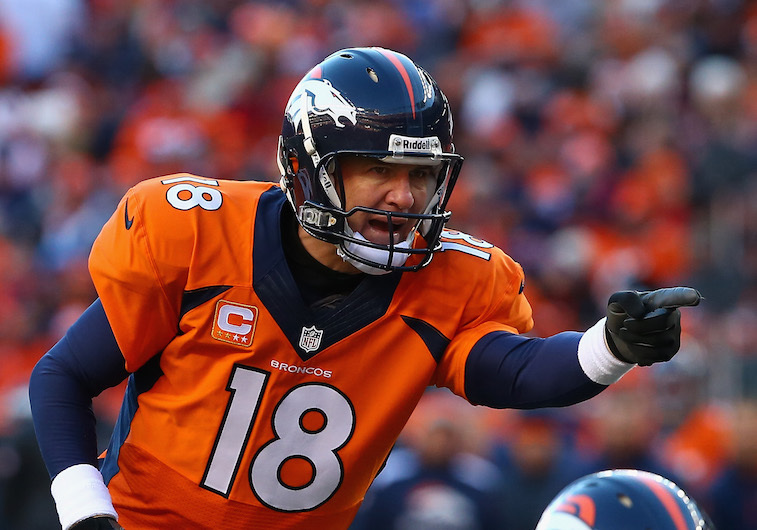 How well will Denver Broncos quarterback Peyton Manning adapt to playing in Gary Kubiak’s offensive system? Kubiak’s scheme has traditionally been reliant on play-action passes and the quarterback lining up under center. Manning hasn’t spent much time doing either since joining the Broncos in 2012. How well the five-time NFL MVP and his new head coach mesh could be the determining factor in how much success the team has in 2015. 2. Will Derek Carr of the Oakland take the next step towards becoming a franchise quarterback in his second NFL season? Carr’s rookie season in the NFL was a tale of two halves. During the first half of the season, he looked like a future franchise quarterback. During the second half of the season, he looked like a quarterback who was destined to be a career backup at best. Not only will his play likely dictate General Manager Reggie McKenzie’s future employment with the team, but his development is also the key factor in the Raiders’ rebuilding project. 3. Will wide receiver Jeremy Maclin prove to be just what the doctor ordered for the Kansas City Chiefs’ offense? It’s no secret that the Chiefs’ wide receivers were highly unproductive in 2014. For Andy Reid’s team to make a return trip to the AFC playoffs, they will need much better production out of the position in 2015. That’s why General Manager John Dorsey went out and signed Maclin to a five-year $55 million contract this offseason. The former Missouri Tiger’s level of production will go a long way in determining the Chiefs’ level of success in 2015. 4. Will rookie Melvin Gordon prove to be the running back that the San Diego Chargers have been seeking since LaDainian Tomlinson left town following the 2009 season? The Chargers selected Ryan Mathews with the 12th overall pick in the 2010 NFL Draft expecting the former Fresno State standout to fill the void in their offense that was created by Tomlinson’s offseason departure. Mathews career in San Diego featured a couple of strong seasons, but was overall disappointing. For the team to return to being a perennial postseason contender, they will need Gordon to step into a workhorse running back role. We think the former Wisconsin badger has what it takes to do just that. Murray only has started three NFL games, but flashed signs of brilliance in 2014. Likewise, Richardson burst onto the scene as a rookie with the Cleveland Browns in 2012, but has struggled to regain that form in the two seasons since. The Raiders will undoubtedly need both players to contribute in 2015, but we believe that the winner of this battle will go on to have a 1,000-yard season in Oakland’s new up-tempo offense. This may not be the flashiest position battle in the AFC West, but it may be the most significant. If the Broncos are going to challenge for a Super Bowl title in 2015, their offensive line needs to be a lot better than they were in 2014. Clark and Harris both have extensive starting experience at the NFL level, but Broncos’ General Manager John Elway thought highly enough of Schofield to use a third round pick on him in the 2014 NFL Draft. Expect this battle to be narrowed to two guys early on during training camp, with a starter being named by the third preseason game. In 2014, the Chiefs’ wide receivers combined to catch zero touchdown passes. The team spent big money on free agent Jeremy Maclin this offseason, but will be looking to upgrade at their No. 2 wide receiver spot, as well. The top candidates for the position are Wilson, an undrafted free agent who made the team in 2014, and Conley, one of the stars of the 2015 NFL Combine and third round pick in the 2015 NFL Draft. The Chiefs desperately need production out of this position in 2015, making this one of the more intriguing position battles of the preaseason. It’s put-up or shut-up time for Te’o, and Butler needs to prove that his lackluster body of work in 2014 isn’t indicative of him as a player. They will both have to fight off Perryman, a second round pick out of the University of Miami, if they want to keep their starting positions in the Chargers’ 3-4 defense. Our guess is that Perryman wins of the jobs, leaving Te’o and Butler to fight it out for the other spot. Count us among those who believe Walford was a steal for the Raiders in the third round of the 2015 NFL Draft. The former Miami Hurricane is the complete package at tight end, and has the ability to develop into a Pro Bowler very early in his career. We see Walford as a very similar player to Delanie Walker of the Tennessee Titans. Gordon could be the player that elevates the Chargers into a playoff team in 2015. If the 22-year-old is able to buck the recent trend of former Wisconsin running backs flopping at the NFL level, the Chargers could easily be a 10 or 11-win team this season. 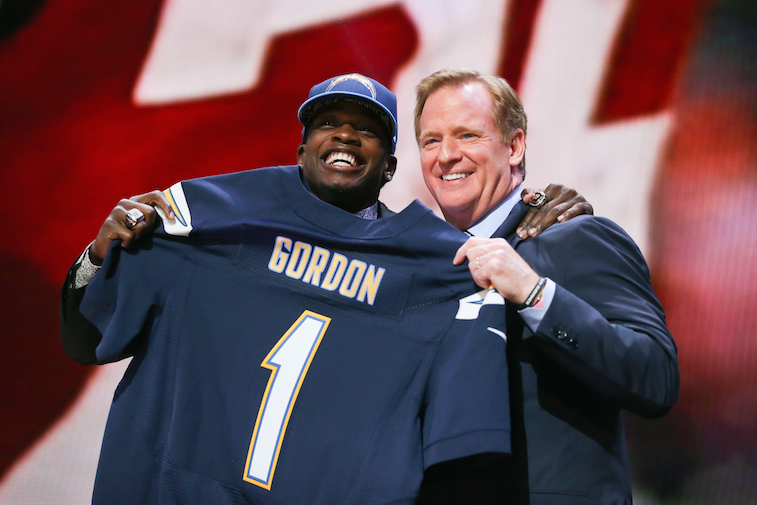 As it stands, Gordon is one of our early favorites to win the 2015 NFL Offensive Rookie of the Year award. The Broncos selected Sambrailo in the second round of the 2015 NFL Draft. While the team thinks highly of the former Colorado State lineman, nobody within the Denver organization intended for him to be the team’s starting left tackle as a rookie. After startling left tackle Ryan Clady, a perennial All-Pro candidate, suffered a torn ACL during Organized Team Activities, the Broncos turned to Sambrailo. The 6-foot-5, 310-pounder has reportedly had a great offseason, and will be entrusted with protecting Peyton Manning’s backside in 2015.
Cooper could end up being the key to quarterback Derek Carr’s development as an NFL quarterback. The former Alabama wide All-American has been nothing short of amazing during Raiders’ Organized Team Activities, and will be counted on to be the No. 1 wide receiver in Oakland as a 21-year-old rookie. Cooper is another guy who is a strong candidate for the 2015 NFL Offensive Rookie of the Year award. Perryman was one of the top inside linebacker prospects in the 2015 NFL Draft, and we think the 21-year-old has the ability to be the next great NFL linebacker to come out of the University of Miami. Expect to see Perryman in the running for the 2015 NFL Defensive Rookie of the Year award.